Buying a pair of boots can be a tricky business, but once you’ve found ones you like you may as well stick with them. My first pair of tramping boots were mobile blister machines. They were made of heavy yellow suede and looked like giant cartoon clown boots. The pain, damage and humiliation they induced were probably the reasons I stopped tramping as a teenager. So 30 years later I was nervous when I bought my first pair of “adult” boots – Asolo 535 Vs – the heaviest, and least “technical” of all the boots on Bivouac’s shelf. They were just as stiff and bulky as my Old Yellows and like my first boots they didn’t have Goretex – the backcountry miracle material that promises to keep our feet dry…somehow. However they were inconspicuously brown and had what I hoped was blister-preventing padding. They also looked tough. Bloody tough. At the sale price of $360 they seemed like value for money. Buying them was a pretty good decision. They soon loosened up and I never got a single blister. But they did fall apart after only about 1200 kilometres of tramping, losing their soles after a trip around Ruapehu. I’ve always imagined it was volcanic juices that melted the glue on quite a complex sole system, but I’ve since heard it was probably a dud batch. When I complained to Asolo HQ in Italy, they helpfully suggested I send them home for repair. Mailing a pair of half-used heavy boots across the world for a retread didn’t seem to make financial sense, so I screwed and glued them for the next six months while saving for something new. A pair of Asolo 535 Vs on sale at Bivouac for $360. Making a good thing better with a Freesole rand. What was I thinking? 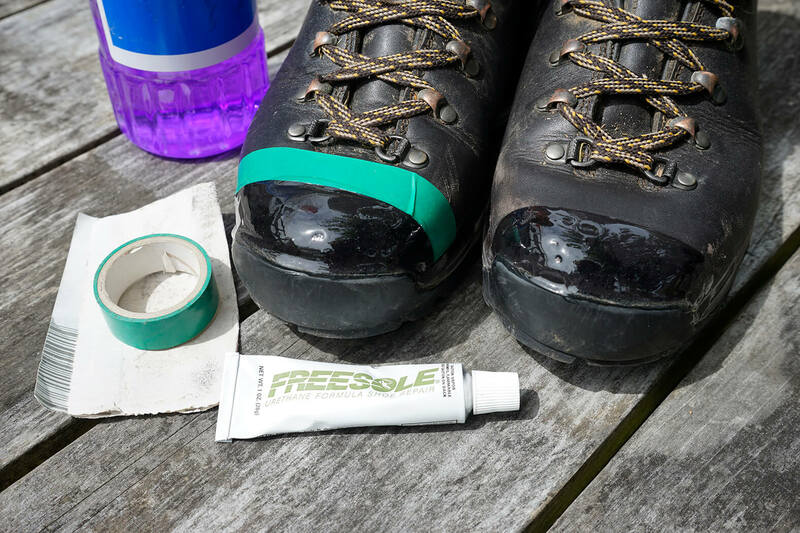 It was a gamble but they were such comfortable boots, I decided to give them one last try…with the addition of a homemade rand fashioned from a tube of noxious goo called Freesole. And they worked. My second pair of Asolos have done well over 3000kms, including about 1500kms of Te Araroa. There is no sign of the soles detaching, in fact the leather uppers are in way worse nick – not surprising given the abuse three months on the trail hands out. They have been excellent support on mountains, in rivers and even on roads – including long periods walking on state highways and beaches. My only blisters have been caused by stupidly wearing two pairs of socks that included a pair of light undersocks ironically designed to prevent blisters. Being Goretex-free has been an unexpected bonus. They tend to dry faster than boots with “water resistant systems” that discourage the entry of moisture but also hinder its escape. They’ve still got a few hundred k’s left in them, but I bought a replacement pair to walk from Wellington to Cape Colville on The Spine of the Fish recently. On sale from Bivouac for $360. Asolo 535s also come in a more slender woman’s model. Wandering around the mountains wearing the same gear as your boyfriend can look a bit weird, so my partner Fiona wasn’t too keen to buy a pair for herself…but they’re so damn good she chose to wear them up The Spine too. She bought them on sale at Bivouac for $360. 5 stars. Comment: I wouldn’t be seen in anything else but Fiona likes to keep her options open. Note: This review was written before my partner and I took our newest Asolo boots on what we called The Spine of the Fish. They did the job well. Road walking is probably their biggest weakness, but road walking is bloody uncomfortable anyway. We suffered no injuries although I had to buy gel inner-soles in Tauranga to soften the impact of constant walking with a heavy pack. My boots carried up to 110kgs for about 800kms and I treated them miserably. They were wet for weeks on end and never complained once…unlike me.